Bernhard Thalheim’s personal website at Christian-Albrechts-University shows a logo that is meant to illustrate the activities of his research group named “Technology of Information Systems”. The logo shows a triangle with Information in the centre, and Content, Concept and Topic at the three corners. 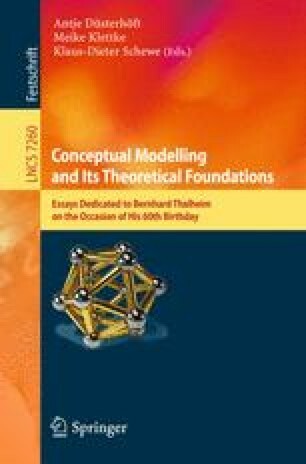 If we were to suggest a logo that illustrates the scientific works and ambitions of Bernhard Thalheim, we would place Modelling into the centre of the triangle, and label the corners with Theory, Methods and Applications. So far, Bernhard’s scientific life led him from mathematics and pure theoretical computer science over database theory to the design of information systems. What looks on the surface like a movement from one end of computer science to another is de facto the enrichment of a global picture, which ultimately aims at a general theory of modelling. In the sense of the German philosopher Georg Wilhelm Friedrich Hegel Bernhard Thalheim has developed himself as a virtuoso for playing with the dialectic antipodes of theory and practice bringing theoretical results into applications and extracting challenging questions from applications in order to shift scientific knowledge to a higher level as kind of “negated negation”. Most recently, he has explicitly declared his ambitions to develop a theory of modelling in an interdisciplinary setting that brings together researchers from mathematics, sciences, economics, engineering and humanities.